Apart from the short days, one of the things I most dislike about this time of year is that there are very few opportunities for planting seeds. There is something rewarding about planting as it holds all the promise of an unknown future, and it’s great to see small seedlings appearing. However, one type of seed that can be planted in late December and early January, is yellow rattle (Rhinanthus minor). Also commonly called hay-rattle, rattle baskets, pots and pans or Tiddibottles. Yellow rattle is described as key to establishing a new wildflower meadow on an area that was previously dominated by grass, because it is semi-parasitic annual of grassy pasture land. After the yellow flowers have appeared in spring time, the plant produces brown seed pods (calyces) in which the seeds rattle when ripe. 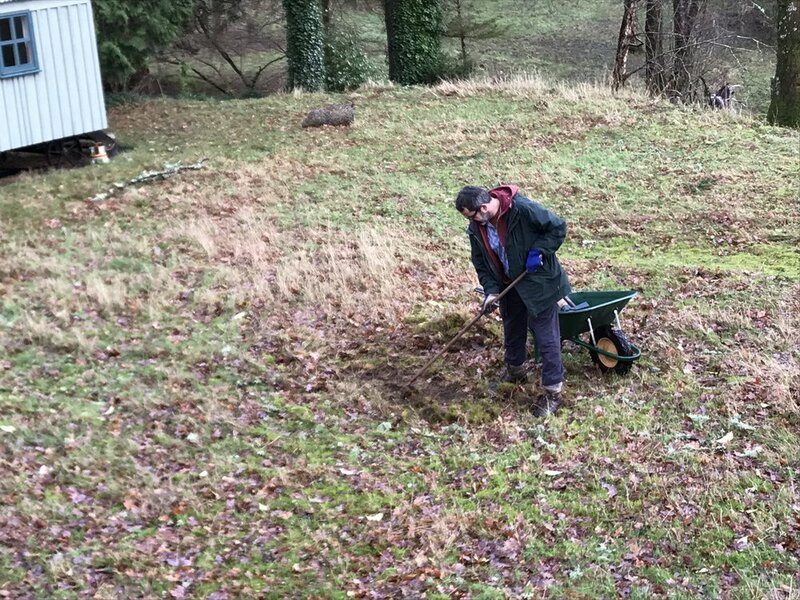 Jon planted the yellow rattle seed in three main zones – some in the orchard, some on the flat lawn in front of the old quarry and some down by the river. In the orchard it was great to be able to make use of the mole hills as planting sites. The reason for planting yellow rattle at around Christmas time is that the seeds need a spell of cold weather to ensure they germinate. The cold weather predicted for the end of the week may therefore be welcome for these seeds. Newer PostLooking after hens in the cold: Mrs Jacky Cluck’s feeling for snow.